The number one question is what does this mean in terms of my taxes? said Appraisal Systems, Inc. head Ernest F. DelGuercio, Sr., at Monday evenings joint meeting of the Township Committee and the Borough Council on the coming revaluation, and that probably explained why there were few empty seats in the Township Municipal Buildings main meeting room. Borough Council engaged in a flurry of activity last Tuesday as it approved the affordable housing plan to be sent to the New Jersey Council on Affordable Housing (COAH), previewed the 2009 budget, agreed upon a mediator for the dispute with the developer Nassau HKT, and drafted a resolution to meet with Township Committee four times every year in addition to any joint budget meetings. 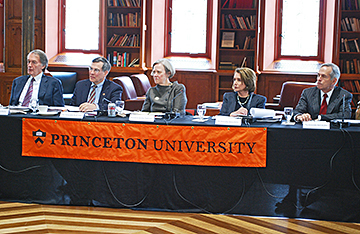 Ending a six-year lawsuit, Princeton University and the Robertson Family have reached a settlement agreement that will dissolve the Robertson Foundation, reimburse the Banbury Fund for legal expenses incurred, and create a new foundation. Twas the night before Christmas for Jon Solomon, or it will be as he hosts the 24-hour holiday radio show on WPRB, the Princeton University station. This year marks his shows 20th incarnation and promises to feature newfangled odes to the holiday spirit, old favorites, forgotten esoterica, and other seasonal jams. The Regional Planning Board heard Princeton Theological Seminarys concept review last Thursday for the demolition of Speer Library and the construction of a new library in its place. No action was taken, but many members of the Board seemed to feel that while demolition would be appropriate, the Boroughs Historic Preservation Review Committee (HPRC) should take another look at the Seminarys proposal. Over the first 79 games of her career with the Princeton University womens basketball team, Whitney Downs averaged 5.9 points a game. James Mooney isnt the kind of soccer player who immediately catches your eye. Last winter, the Princeton High boys basketball team produced one of the feel-good stories in local hoops circles. In the Fall of 1976 a literary agent based in Pennington received a novel in manuscript by way of a close friend and college classmate who had moved to Paris from Hopewell. The author was an expatriate American painter living in a houseboat on the Seine. Though he had a modest reputation as an artist, he was in his early fifties, unpublished, and, as a writer, unknown. The agent was so excited by what she read that rather than mail the manuscript, she took it in to New York personally, by car, and delivered it to an editor at Knopf, who read it and was equally excited. The first and only publisher to see the book, Knopf scheduled it for publication in Fall 1978, then held it back until January 1979 in order to avoid a major newspaper strike. With the press functioning again, the reception accorded the author’s first novel, Birdy, made him an instant literary sensation. The impact of his arrival on the scene could still be felt some 30 years later in the attention the press gave to his death. William Wharton, whose real name was Albert William du Aime, died on October 29, a little over a week short of his 83rd birthday. For alert Princeton audiences, a free concert treat slipped through the University campus on Friday night. The members of the Brentano String Quartet are Artists-in-Residence at Princeton University’s Department of Music and as such give back to the community in the form of a free concert from time to time. The Quartet’s performance on Friday night in Richardson Auditorium featured both a legend in chamber music and a well-established vocal soloist, who had not been in Princeton before, performing some pretty hair-raising music.